For Remembrance Day 2013, I’m going to share with you the brief story of a man who has no family connection to me whatsoever. He made himself known through a photograph found in my cousin’s extensive photo collection. My 4th cousin in Sydney is one of those people who has myriad photographs stored in suitcases – probably literally hundreds of them. Some have names on them, but sadly not all. She has been a wealth of information about my own family but there are also hidden gems of no direct relevance to me. 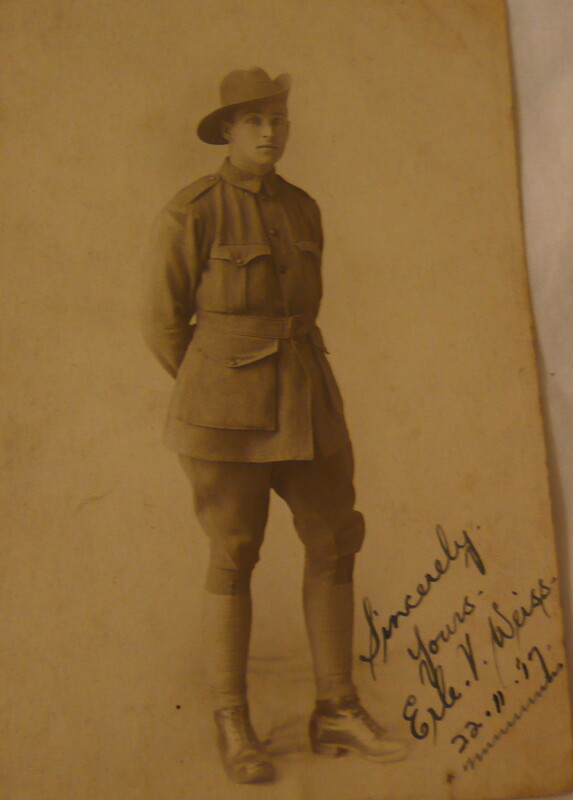 Among her collection is this photograph postcard from a young Australian soldier who was killed in World War I, Erle Victor Weiss. 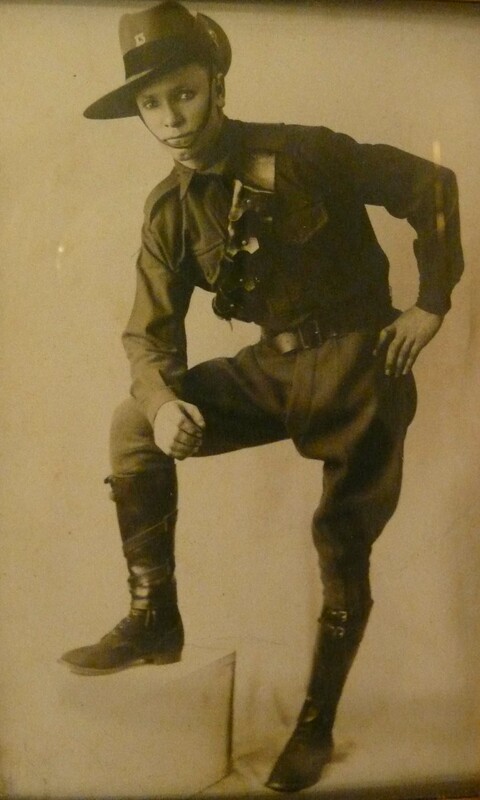 Erle was another of the young men, descendants of German ancestors, who fought for King and country in World War I. You will see from his note to his friend that he did not affiliate with the Germans he fought, referring to them as “Huns” in the vernacular of the time. Given the social attitudes of the era I often wonder whether those with German names felt they had to be more English than others, and whether it provoked them into joining up as soon as possible. Erle had joined in August 1915 and was a bombardier with the 1st Field Artillery Brigade. He had been severely gassed in November 1917 and it was during this period of hospitalisation in England that he wrote to my cousin’s mother. This postcard strikes me as a letter to a young woman with whom he was perhaps in love. Whether she was just a friend or reciprocated his love is unknown, though the fact that the postcard has been preserved all these years suggests she was very fond of him. 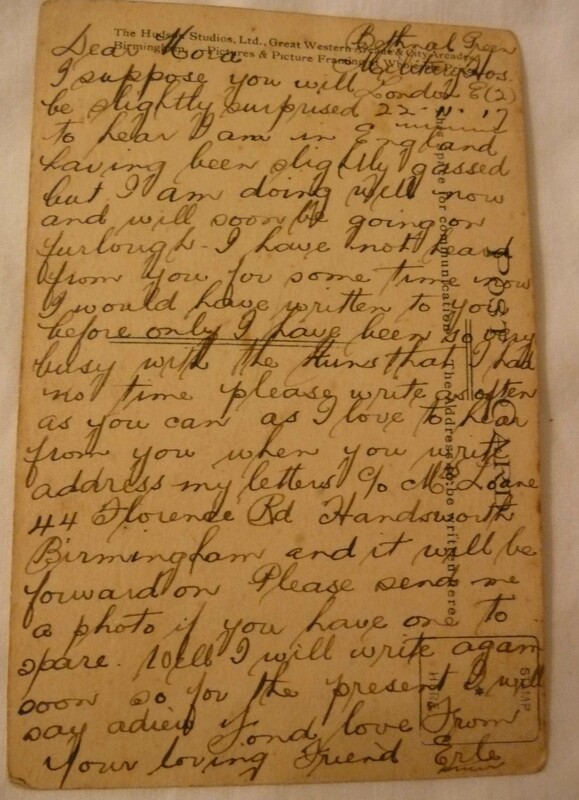 Erle was killed on 9 August 1918 nine months after this letter was written and is buried in Heath Cemetery, Harbonnieres. His brother, Frederick Alfred Weiss, died on 19 July 1916, in the Battle of Fromelles. 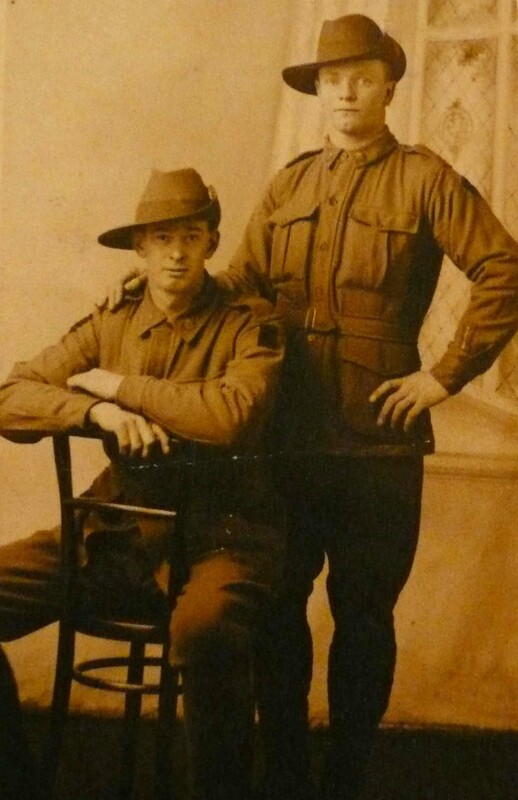 These two young men were the eldest sons of Walter Henry and Amy Selina Weiss who lived at Erina, New South Wales where it seems Walter was a school teacher. Erle’s friend, Norah, married another former soldier Leslie Gladstone Fisher in 1925 in Surrey Hills. Were the two men friends? Had they ever met? It is impossible to read the files for the young men who were killed during the war: there is such pathos in each and every letter written to the authorities by their next of kin. All they had left to hope for were some items of their son’s to treasure, and in Erle’s case this amounted to 2 photos, 1 card, a belt a damaged wallet, a pocket book and a scarf. The significance of the war memorials, especially in Australia, is knowing that a memorial and small personal items were the only tangible reminders of their son’s sacrifice. Among the photos are two unknown soldiers, I thought I would include it here in case someone else recognises them. This entry was posted in Australian history, Family History, Remembrance Day, World War I and tagged Erle Victor Weiss, Leslie Gladstone Fisher, Remembrance Day 2013, World War I by cassmob. Bookmark the permalink. I suggested the site of the war diary as I would suspect it would get lots of hits… it is a forum. We planted Flanders Poppies this year with our children (we visited the war memorial in Canberra on 11/11/11, and then again last ANZAC day where we bought the seeds), I did share a couple of photos so the kids can share. 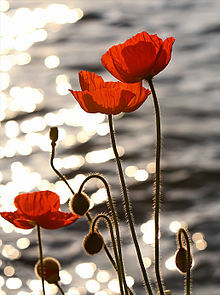 The act of remembrance is something we want to instill in our little ones, their memory is every important. Thank you for your comment. What a lovely idea to plant the poppies with the children and encourage them in the act of remembrance. Apart from the military aspect I’m sure it will also become an important part of their own family memories. Thanks so much for visiting. Well Pauleen, he may be unrelated to you, but he’s my 1st cousin twice removed!!!! We are related through my 2x great grandfather, Frederick Adam Weiss (http://becomingprue.blogspot.com.au/2011/05/frederick-and-rosetta-weiss.html) – Walter was one of his sons, thus Erle his grandson. I’ll have to do some digging and see whether I can find anything about Nora amongst family records. Not only did Walter lose two sons in WW1, but also another son, Harry Blanch Weiss, was a POW in Thailand in WW2 and died there. His diary was serialised in the Singleton Argus many years ago, and can be found via Trove. Thanks Pauleen, and if I find out any answers about Nora I’ll you know!